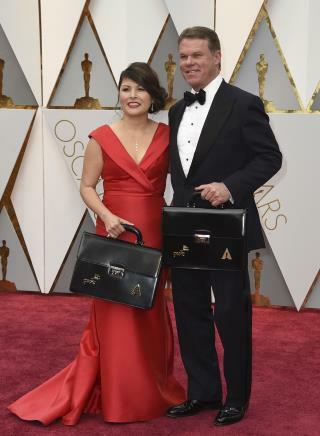 (Newser) – The PwC accountant whose backstage tweet may have distracted him enough to cause the biggest flub in Oscars history was specifically asked not to tweet during the awards show, a source tells People. "Brian [Cullinan] was asked not to tweet or use social media during the show. He was fine to tweet before he arrived at the red carpet, but once he was under the auspices of the Oscar night job, that was to be his only focus," the source says. "Tweeting right before the Best Picture category was announced was not something that should have happened." The tweet in question, along with others from backstage, have since been deleted. PwC said in a statement Monday night that "once the error occurred, protocols for correcting it were not followed through quickly enough by Mr. Cullinan or his partner," per Us. If democrats would scrutinize their political figures as much as they are looking for blame on this stupid show the country would be a much better place. BFD - Seriously - its made for more talk, it made for more fun, it made for more attention which the event needs. good promo.